UPDATE XI: Another graphic representation of Obama's failure to fulfill Republi-con delusions "about inflation, the dollar, and, well, the whole economy the past few years. . . It was a weird thing to be worrying about. 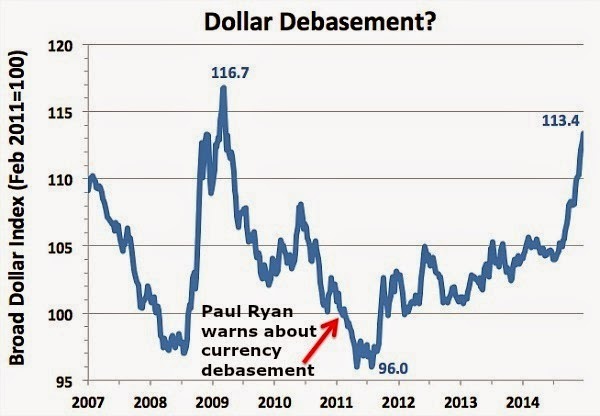 Inflation was just 1.7 percent when Ryan brought up dollar debasement (in early 2011). It's 1.2 percent now. And, as you can see below, rather than being debased, debauched or otherwise devalued, the dollar is actually up 13 percent against a broad index of currencies over this time. Even if you judge the dollar against a basket of commodities, which you shouldn't, since those prices are set in world markets beyond the Fed's control, there hasn't been anything resembling 'debasement': Brent oil has fallen from $100 to $53 and gold from $1,362 to $1,211." UPDATE X: "On March 6, 2009, former George W. Bush adviser Michael Boskin offered whatever the opposite of a prophecy is when he said that 'Obama's Radicalism Is Killing the Dow.' Now let's set the scene. Obama had been in office for less than two months at that point, and in that time, stocks had admittedly fallen a lot as markets worried that the big bank bailout known as TARP wouldn't actually be enough to save the banks. It got so bad that Citigroup briefly became a penny stock. Boskin, though, didn't think that this once-in-three-generations financial crisis was to blame for the market meltdown. Instead, he blamed it on Obama for ... talking about raising taxes? 'It's hard not to see the continued sell-off on Wall Street and the growing fear on Main Street," Boskin philosophized, "as a product, at least in part, of the realization that our new president's policies are designed to radically re-engineer the market-based U.S. economy.' What followed was the usual conservative jeremiad against higher taxes on the rich, lower taxes on the poor, and deficit spending. Obama's trying to turn us into Europe, and that's why markets are pricing in the possibility of a Great Depression—not the dying economy he inherited." UPDATE IX: After a weekend of price cutting at stations, gas for less than $2 can be found in 13 states across the country. Two weeks ago there was only one gas station in the country selling gas that cheap. Read CNN, Gas for less than $2 is now widespread. UPDATE VIII: What an unmitigated failure Obama has been trying to destroy the economy and country. Gas prices continue to tumble. Read the Cleveland Plain Dealer, Gas prices could drop to $2 gallon in some parts of country by end of year. And "[s]even years after the credit bubble burst, just two of the 12 countries that went through systemic financial meltdowns in 2007 and 2008 have reclaimed enough ground to reach their previous peaks in per-capita GDP: the United States and Germany. And Germany isn’t looking so hot these days, given that it’s teetering on the edge of deflation. Many of the other countries that also went through “systemic crises” — as categorized by the work of Harvard economists Carmen Reinhart and Kenneth Rogoff — still have years to go before fully recovering. The Netherlands, Portugal, Spain and Ukraine will likely wait until 2018 before reaching their pre-crisis peaks in per capita GDP, according to the International Monetary Fund. Even countries that didn’t technically experience a systemic crisis when we did (such as China and Japan) appear to be in serious trouble. As the Economist recently put it, the United States is looking increasingly like a 'lonely locomotive.'" Read the Washington Post, How the U.S. economy got its mojo back. UPDATE VII: After predictions of $5-10/gallon for gas, prices are below $3/gallon. "The gas price tracking app GasBuddy reports that 46% of gas stations around the country are now charging less than $3 per gallon, compared with just 3% one year ago." Read Time, Last Time Gas Prices Were This Cheap, It Was January 2011. UPDATE VI: Still a socialist/communist failure, Obama can't even destroy the economy. Read the Washington Post, Rebounding economy fills state coffers with record tax revenues and The New York Times, Tax Revenue Rockets Up, Helping Lessen the Deficit, Treasury Department Says. UPDATE V: Republi-con "predictions about the impact of these policies since they first began in late 2008 have been wrong so far. Inflation has not spiked, and the value of the dollar has not collapsed. At this point, in fact, there are more worries about deflation than inflation. But thanks to the tea party influence in the GOP — in particular the Fed-bashing Rand and Ron Paul wing of the party — ripping the Fed and the bigger role it is playing in the economy has become more a litmus test for party loyalty, regardless of whether the dire predictions have come true." Politico, GOP warnings have not met Fed policy reality. With respect to David Farragut would say of Republi-cons, damn the facts, full bull ahead! UPDATE IV: So much for those invisible [Republi-CON] bond vigilantes'. "The consumer-price index dropped 0.1 percent, reflecting cheaper energy, clothing and new cars, after a 0.2 percent gain the prior month, a Labor Department report showed today in Washington." Read Bloomberg, Consumer Prices in U.S. Decline for First Time in Six Months. Now Obama has fail to create the Republi-con's imaginary hyperinflation. UPDATE III: After predictions of $5-10/gallon for gas, prices are near $3/gallon. Read The Wall Street Journal, Halloween Treat: U.S. Gasoline May Fall Below $3 a Gallon. UPDATE II: Another Obama's failure, and lost opportunity to destroy capitalism: Read USA Today, S&P says shrinking U.S. deficit boosts debt outlook. UPDATE: More evidence of Obama's failure: "The S&P 500 has risen more than 25 percent over the last year. It’s risen more than 100 percent since President Obama was inaugurated. [Even] wages might pick up soon. After all, most everything else is. Housing prices are rising faster than at any time since 2007. Autos are doing great. Consumer confidence just hit a five-year high. These aren’t just the kinds of numbers that foretell recovery. They’re the kinds of numbers that lead to recovery. A rising stock market doesn’t necessarily mean more jobs anytime soon. Rising housing prices and car sales almost certainly do." Did you know that "the Dow Jones Industrial Average has soared an astonishing 62% (sixty-two percent!) since the Kenyan Socialist Barack Obama seized the White House in a violent Saul Alinsky coup." The last president was a much better at destroying capitalism, when he "left office the Dow was 25% lower than it was when he took office eight years earlier", and the economy was losing nearly 800,000/month. 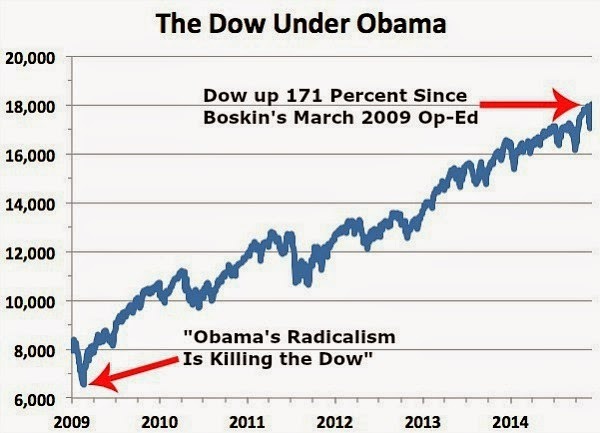 Read Wonkette, Dow Soars 62% Since Obama Took Office; Do Stocks Have Liberal Bias? For more on Obama's socialist failures, read The Republi-CON 'Obama's a Socialist' Myth.